What every garden needs is a fit gardener, and as much as I love gardening, there were a couple of jobs in my garden that needed the brute force and muscles of a guy! Having not been maintained for forty odd years, it had become something of a winderness with a tree canopy to rival the best of any tropical rainforest. We have had a stream of “garden” types knocking in the door over the last few months, some of whom were surely more the genre of burglers on a reconnaissance tour but one amongst them clearly knew his trees, despite the absence of leaves, and I decided to put him to work. 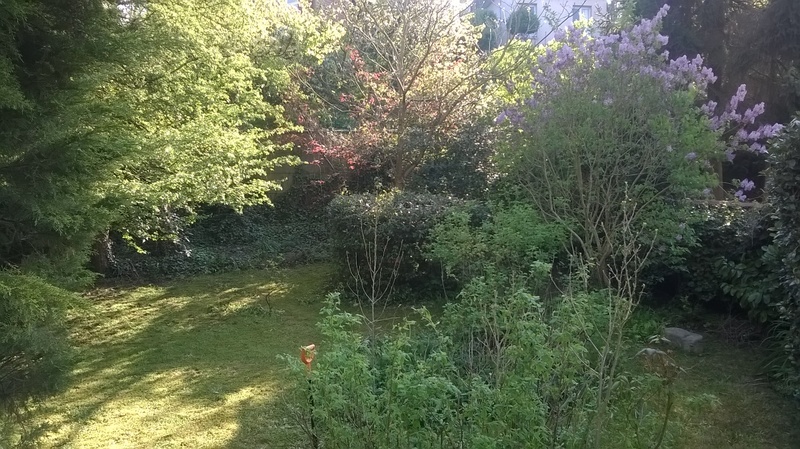 Having tackled the “lawn” on his first visit, the visual impact of which was so positive, I decided to rope him in for the major task of removing two trees. 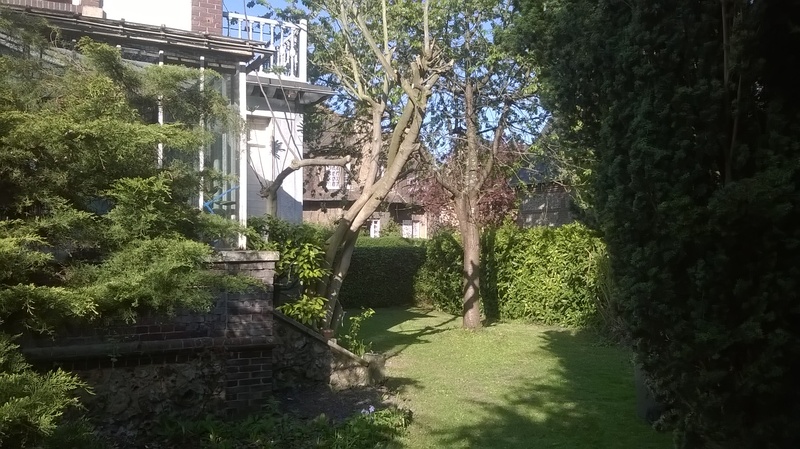 One of the trees effectively blocked the view of the garden from the conservatory, a Thuja, which had fallen over some time in the distant past and was growing horizontally across the garden, and the second, a large Hawthorn tree which effectively dominated the rest. 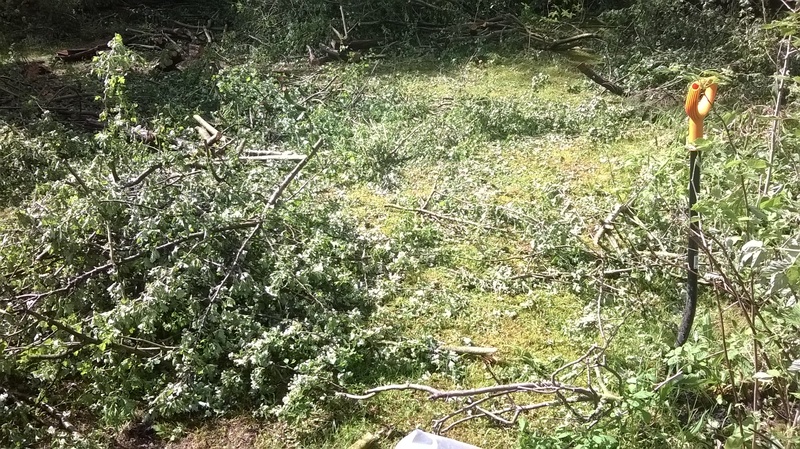 “Fit Gardener”, as we like to call him, on account of his chic french gardening attire and cheery disposition made short work of the two trees and used what remained of his allotted time frame to start gathering up the overwhelming quantity of branches into small bundles. He came into the kitchen and asked if I had any “ficelle”, and I looked at him a bit non-plussed until it dawned on me that he was looking for natural twine. When it comes to rubbish, recycling and refuse removal, the french are at the top of the game. 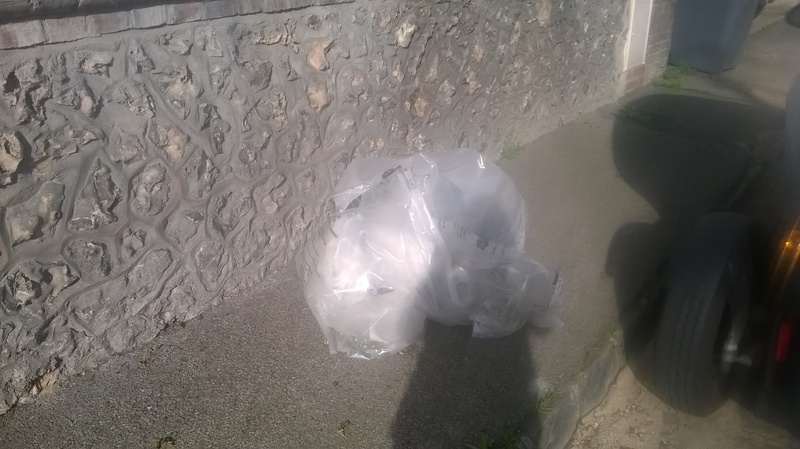 Every dechetterie (dump) in France has a stock of bags for different purposes, including yellow for paper and recycling of packaging and white for garden waste, along with each house having a green bin for bottles and a black bin for general waste. 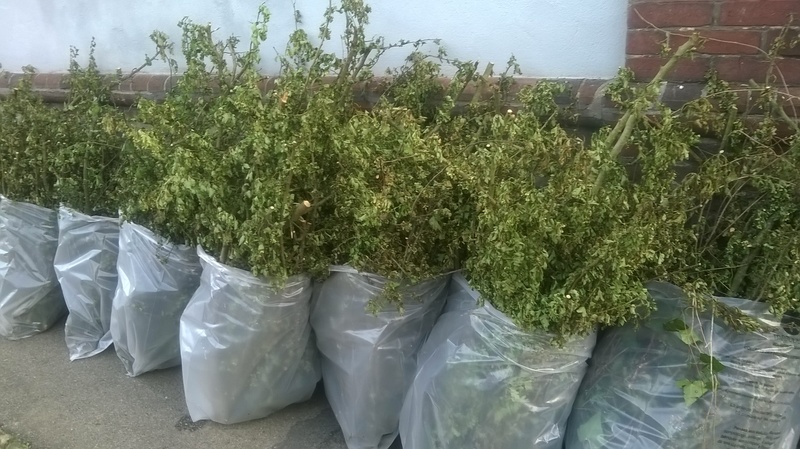 When I visited the dechetterie I explained to the man in charge that my garden hadn’t been touched for years and he handed over 25 reuseable garden sacs to fill with garden debris. 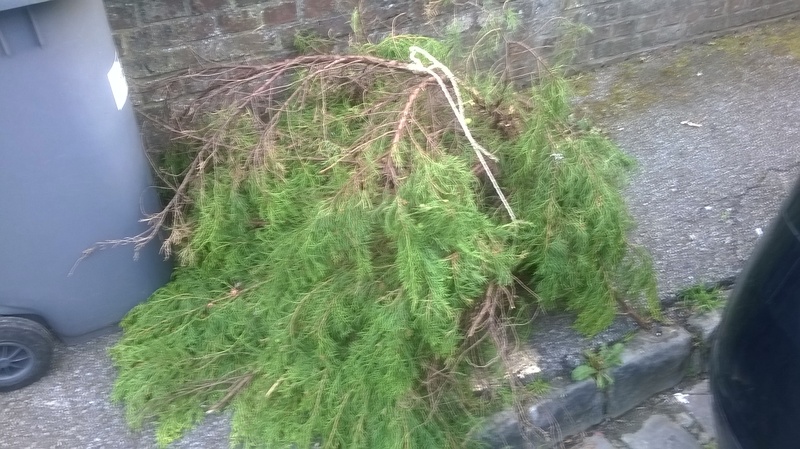 “Fit Gardener” had made a massive inroad into the branches from the Thuja in my absence, gathering and roping them into bundles with the twine. The rules on the recycling website are that the bundles or “fagots” as the French call them must be no greater than 15cm thick, but ours were at least double that, and well tied with bio-degradeable twine. I stared in astonishment at the twenty or so fagots left at my gateway, expecting them to be carted away, but “Fit Gardener” assured me that the recycling truck would pass on the monday morning, having expected all house owners to have been gardening over the weekend, and would take it all away. I was unconvinced. When I woke at 7 the following morning the pavement outside my house was empty, and all the fagots gone. 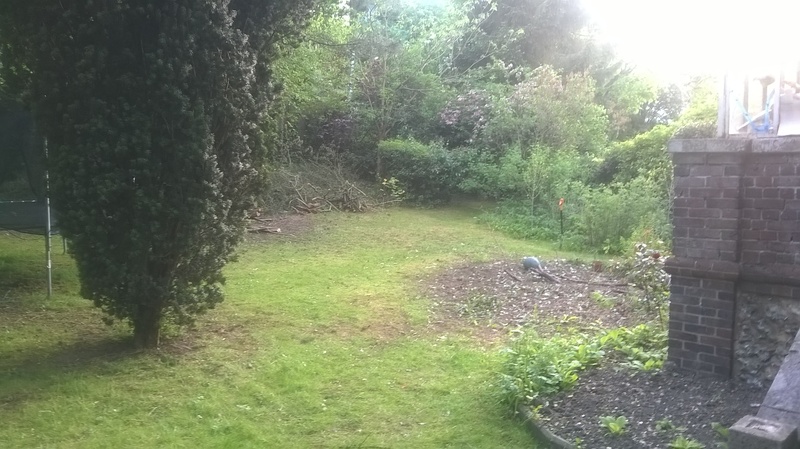 Time hadn’t been on “Fit Gardener’s” side, and the nasty thorny Hawthorn lay still spread across the garden. 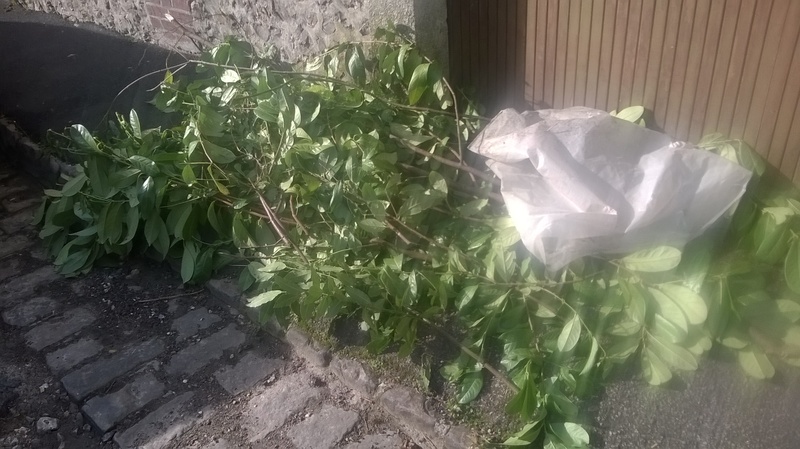 I didn’t believe that the guys driving the recycling truck would look on kindly to fagots of Hawthorn, some of the thorny spikes being a finger-length long, and so I took out my secateurs to chop each branch into metre-long lengths before filling the large recycling garden bags. 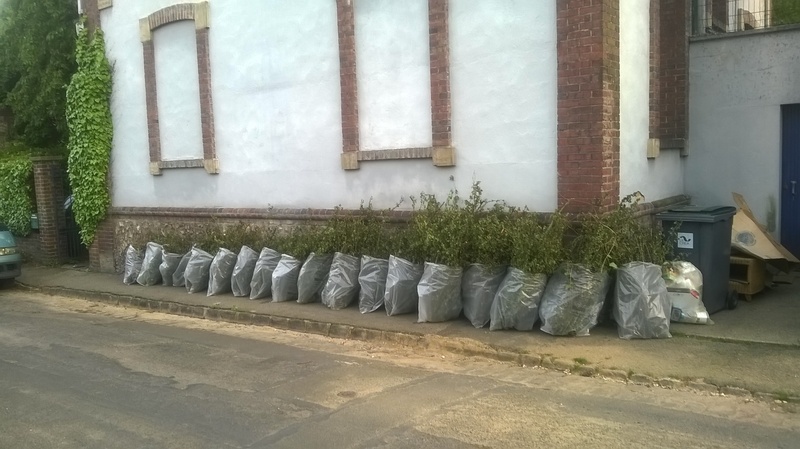 It took several days of back breaking labour before all the branches were safely removed from the lawn and the bags stacked in a row ready to be put out onto the street on sunday night. 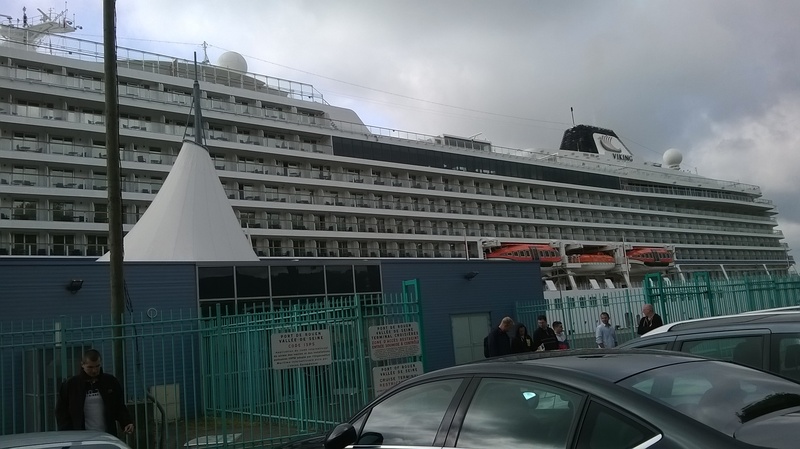 On sunday, pleased with my progress I headed off to work as usual, a full day of tours of the city for an ocean-going cruise-liner that was moored up at the Port of Rouen. Not even having time for a pause for lunch,( which suggests the day had not been organised by a Frenchman), by the time I arrived home in the early evening exhaustion was setting in, dinner was still to cook, and the kids had very kindly left the remains of breakfast out on the table (apparently for me to tidy up when I got in as they had been very busy during the day – playing computer games!) So you can imagine the groan when the evening came to an end and I was locking up, only to spot the gardening bags still waiting to be moved out onto the street! 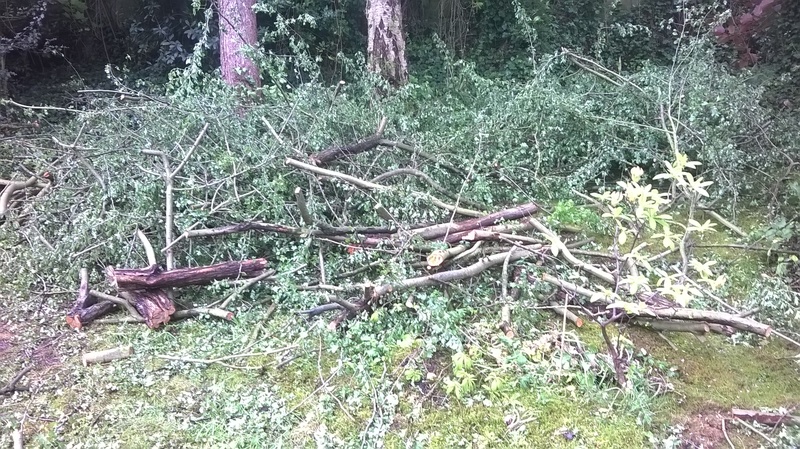 You can see that I got more daring as time went on – filling the bags with ever greater quantities of thorny branches! Once I had lined them up I had severe doubts that the recycling van would take them all. 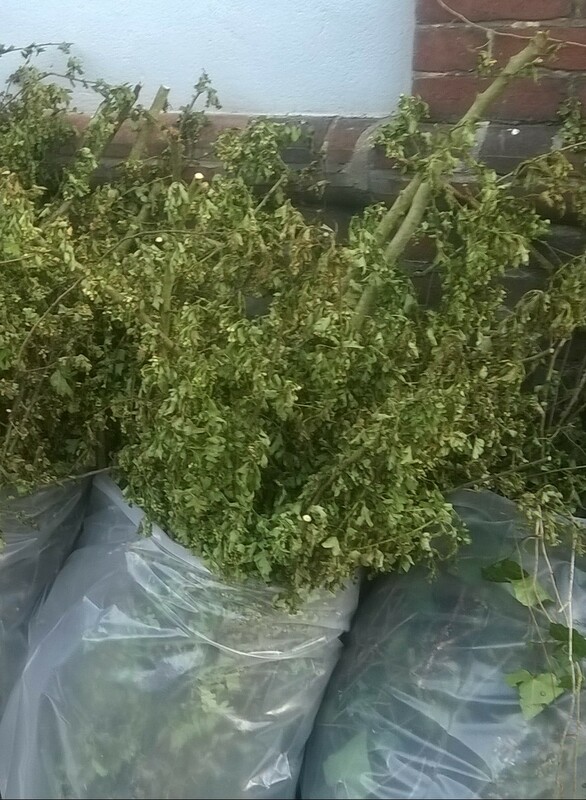 I looked at my neighbours little pile of greenery waiting to go and conceded that his waste was much more reasonable and crossed my fingers that the van-driver would take pity on me! When I left for work on monday morning I was astonished to see that the pavement outside my house was competely clear, and that my neighbours little pile was still resolutely lying on the ground where he had left them. 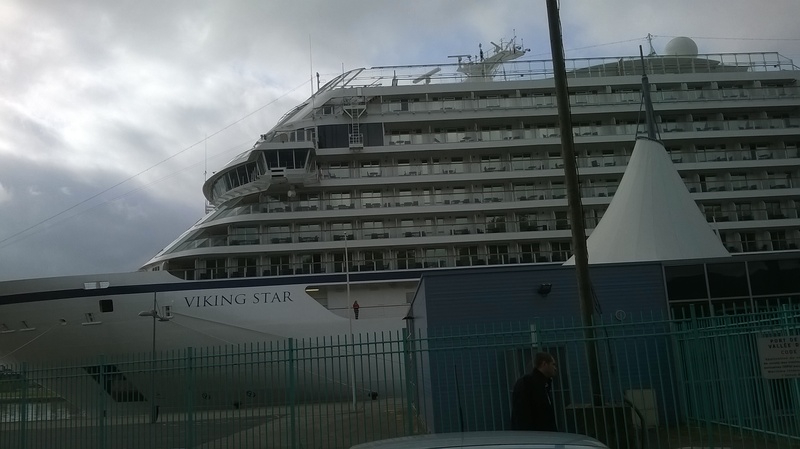 And then I went for a closer look…. …only to find that my neighour had made one serious omission. In the land of “red-tape” and regulation, rules and obligations he had failed to put any ficelle around his bundle of greenery; whilst my back-breakingly bagged monsters had all disappeared! Which just goes to show that a bundle of greenery without “ficelle” is simply not, and never will be a “fagot” – nor will it ever be good to go! Don’t say you haven’t been warned! 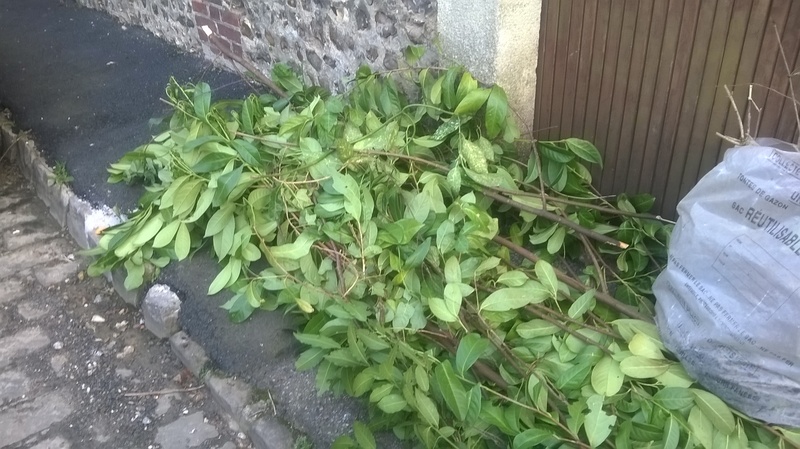 This entry was posted in French House Renovation, gardening and tagged Dechetterie, fagot, ficelle, France, Gardening, Hawthorn, Normandy, recycling, Rouen by frenchimmersion. Bookmark the permalink. I loved reading this, so now I know all about faggots and what to do with ficelle! Sadly the truck collecting green debris does not come to our village, only plastics and general rubbish. But we have experienced the fercious way the man at the dechetterie watches what goes where, woe betide anyone who tries to put something in the wrong place!!! sorry, auto correct kicked in, that was meant to say ferocious! I knew what you meant! Oh I think we are lucky then, since my car had packed up it was heaven to leave everything outside and find it gone in the morning. 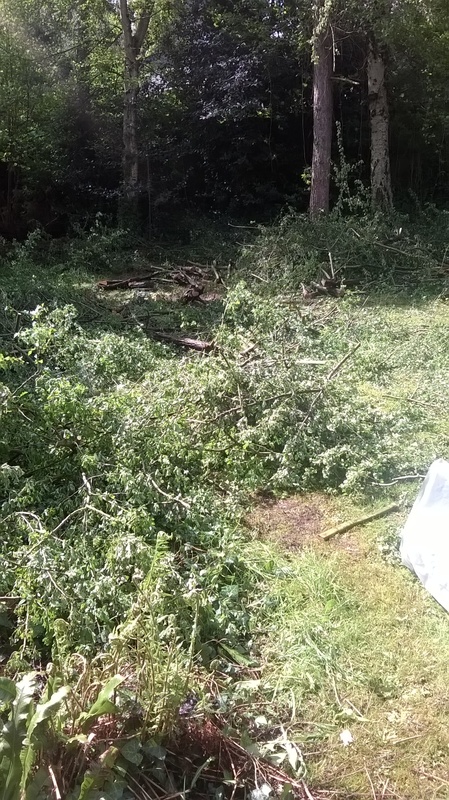 We have another massive mountain of garden cuttings left by the previous owner, who in his 87 years took it upon himself suddenly to trim some bushes until I politely asked him to stop in case he induced a heart attack! You absolutely do not wish that on him, I agree. Although sometimes it drives me insane, I think France has an excellent recycling attitude. Although I must own the world’s largest collection of heavy duty supermarket bags as I shell out another 2 euros for yet another one!!! I to arrive at the supermarket forgetting completely the ever growing mountain of heavy duty bags. I am clearly in competition with you. One day we must get together and see who wins! And I did worry that the owner would have a heart attack before selling his house to me, and then the cat would have been amongst the pigeons with inheritance laws! !